The EOS 60D (my camera at the moment) offers a range of three Auto focus (AF) modes (One Shot, AI Focus and AI Servo). This is a really good feature to know about and I suggest you learn it. It can make the difference between getting the shot and not getting the shot. Personally, I don’t see much of a reason to use AI Focus. Trusting the camera to do the right thing may be detrimental to your photography experience. When focus is achieved, the AF point which achieved focus will flash briefly in red, and the focus confirmation light <o> in the viewfinder will also light. If focus cannot be achieved, the focus confirmation light <o> in the viewfinder will blink. If this occurs, a picture cannot be taken if the shutter button is pressed completely. Recompose the picture and try to focus again. 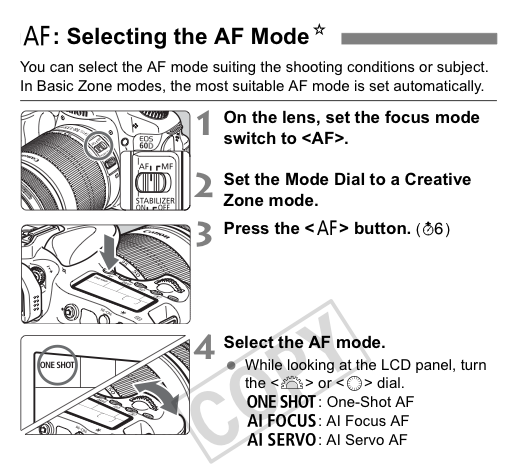 AI Focus AF switches the AF mode from One-Shot AF to AI Servo AF automatically if the still subject starts moving. After the subject is focused in the One-Shot AF mode, if the subject starts moving, the camera will detect the movement and change the AF mode automatically to AI Servo AF. When focus is achieved in the AI focus AF mode with the Servo mode active, the beeper will sound softly. However, the focus confirmation light <o> in the viewfinder will not light. This mode is for moving subjects when the focusing distance keeps changing. While you hold down the shutter button halfway, the subject will be focused continuously. With AI Servo, the beeper will not sound even when focus is achieved. Also, the focus confirmation light <o> in the viewfinder will not light.